We have experimentally obtained support for the feasibility of detecting cereal grains of different grinds from the diffuse reflectance spectrum. 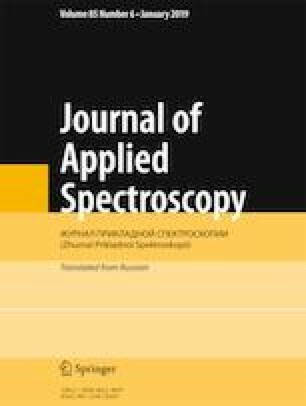 As the features describing the diffuse reflectance spectra of wheat and oats of different grinds and moisture contents in the near IR range, we used combinations of optical densities and their second derivatives for the wavelengths 1200, 1422, 1778, 1916, and 2114 nm. Using logistic regression as an example, we constructed 20 classification models based on the two features: 10 models for the optical density and 10 models for the second derivative of the optical density, corresponding to the selected wavelengths. The best classification results were obtained with an algorithm using the values of the second derivative of the optical density at λ = 1778 nm and 2114 nm as the features. Translated from Zhurnal Prikladnoi Spektroskopii, Vol. 86, No. 1, pp. 122–127, January–February, 2019.